1) The official video for this song was filmed on board the battleship USS Missouri. When is the last time you were on a boat or ship? August of 2009 when we went on the Dolphin Tour in Orange Beach, Alabama. I love boats and we live near a lake, but we never go. 2) This song was written by Diane Warren. Ms. Warren has written love songs recorded by Celine Dion, Toni Braxton, LeAnn Rimes and more, yet she's never married and has really only had one serious romantic relationship. She acknowledges this makes her an unusual spokeswoman for the glory and pain of love. When you have a relationship problem, who do you go to for advice? I guess my mom. 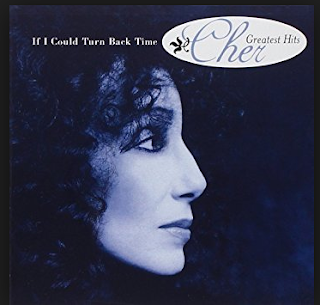 3) In this song, Cher wishes she could turn back time and have a different conversation with a former lover, changing what she said to him. Here at Saturday 9, we're not so ambitious with our time travel. We're only going back to yesterday. Is there anything you'd do differently? no, yesterday was a great day! I had a night out with the girls last night and we had so much fun. We went out to dinner and to a woman's Christian conference. Then afterwards we went and had frozen custard. We all got a free book at the conference too! 4) In 1966, Cher and her then-husband Sonny sang at a private birthday party for Jacqueline Kennedy. At first, Cher didn't want to do it, thinking that performing to a small gathering would be awkward. But it turned out to be a wonderful opportunity for her. That night, she met Diana Vreeland, the editor of Vogue. Vreeland liked Cher's look so much she set up a photo shoot. Cher, who always loved experimenting with hair and makeup, enjoyed the shoot immensely. Tell us about a social gathering where you had an unexpectedly good time. I knew I would have fun last night, so I will say last Christmas with Karl's family. He has a sister and his mom too are super loud and get on my nerves. Well, they were kind of calm this year and my nephew had all of his little girls there and we all played with the little girls....they are so super cute! 5) At that same party, Cher said she was surprised by how big Jackie's hands were. Do you like your hands? not really. I have short fingers. 6) One night, before a performance in Detroit, Cher saw a little furry something under one of her tour buses. It was a kitten that that she named Mr. Big, hoping he would grow into the name. He did, and the tomcat was her constant companion for four years until he died of a congenital heart ailment. She has said that she will "never not miss him." Is there a furry companion who has a special place in your memories? I had a dog in high school named Kai...he was so cute. The pet I will "never not miss" when she passes is my dog Mandy who is getting close, she is old. 7) Cher recently appeared in Mamma Mia: Here We Go Again. It's the second movie based on the music of ABBA. What's your favorite ABBA song? Mamma Mia I guess. 8) In 1989 -- the year this song was popular -- Mattel released a series of special "Scarlett O'Hara" Barbie doll to commemorate the 50th anniversary of Gone with the Wind. Did you enjoy the classic movie? Have you read the book? I enjoyed the movie, I never read the book. My son just finished it though. 9) Random question -- Check your spam folder and tell us one of the subject lines. Free puppy with every purchase. Free puppy with every purchase?!! That made me chuckle. I enjoyed reading your answers today! Happy Saturday! A free book and custard is the very definition of a good time, isn't it? I canceled plans with my friends last night because we were supposed to have a winter storm--boo! Free puppy? Wowser. Lots of folks doing dolphin cruises. I feel like I'm missing out. A free puppy.. how funny! You should tell us about the dolphin cruise. sounds interesting. Your son read Gone with the Wind? I am impressed that's way over what you'd expect for his age. Hi Lori, Free puppies?? Spam for sure! LOL! Enjoyed your answers my friend. Have a blessed day ahead.